Mike, 36, confirmed his wedding to longtime love Lauren Pesce, 32, will air on Season 2 of Jersey Shore: Family Vacation later this summer. A Twitter user tweeted on Tuesday, "I wonder if Mike and Lauren's wedding will be televised! I really hope so!" Mike then replied to the post, "Yes! Season 2 of #JSFamilyvacaton." The second season of Jersey Shore: Family Vacation is set to premiere in August 2018. 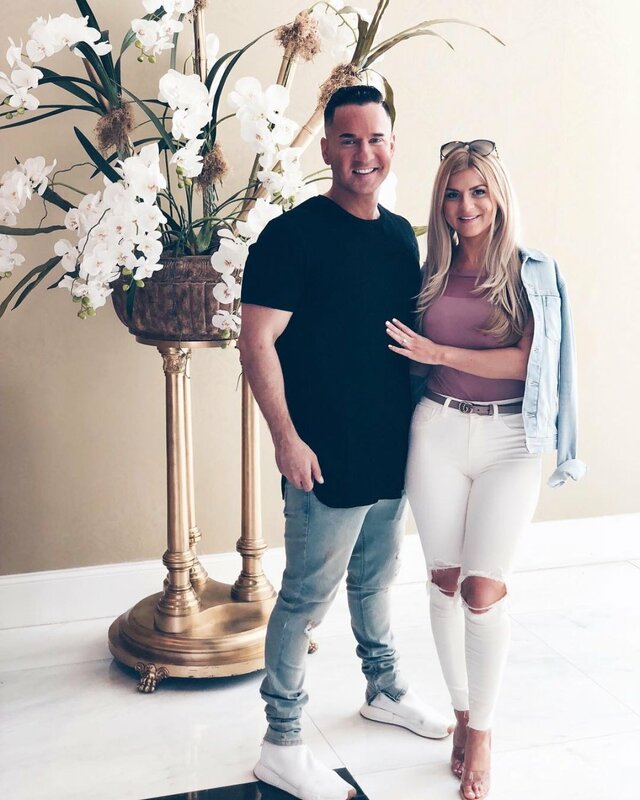 Mike and Lauren announced their engagement in April, but Us Weekly reported Mike actually popped the question to his college sweetheart on Valentine's Day. Mike's Jersey Shore co-stars Jenni "JWoww" Farley, Paul "Pauly D" DelVecchio, Nicole "Snooki" Polizzi, Ronnie Ortiz-Magro, Vinny Guadagnino and Deena Nicole Cortese reportedly helped set up a romantic proposal in Miami, FL. The marriage proposal aired on the first season of Jersey Shore: Family Vacation late last month. "We are starting the planning process for the upcoming season," Mike told Us in April of the wedding, adding they're going back and forth between a small, intimate destination wedding and a big event for all of their family and friends. "I think we're going to try to have the best of both worlds." Lauren noted at the time she'd probably be relaxed and calm during the typically-hectic and stressful wedding planning process. "The amount of time I've waited for this moment has humbled me and made me be able to be more mindful and appreciate the moment," Lauren shared with the magazine. "As much as people don't want to hear it, it's always worth the wait. It couldn't have happened at a better time in our lives." Season 2 of Jersey Shore: Family Vacation is reportedly currently filming in both Las Vegas and Seaside Heights, NJ, so it's possible there will be a wedding celebration at each location. Mike and Lauren have yet to set a wedding date, according to Us. Mike and his co-stars rose to fame on the MTV reality series Jersey Shore, which concluded in 2012 after a six-season run. The finale of Jersey Shore: Family Vacation's debut season just aired on June 28.